"In some ways, I prefer Skype to in-person author visits." I've learned one true thing: hang around teachers and they will teach you things. It's their superpower. For me, it was one of those perspective-tilting moments. That sentence, spoken by my friend Kara Dirst, made me tip my head like a dog who just heard a Goldfish cracker hit the floor. Skype can be better than real life? How could that be? If you write for kids, I hope you have some wonderful elementary and middle school teachers in your life. They say the most interesting things. When Kara made that simple statement about Skype author visits, it gave me pause. I had to know more about how she uses Skype to connect her students to authors and books. Here is the result of that conversation. Welcome, Mrs. Dirst. Can you tell the Kidliterati a little about yourself and your students? I have taught middle school Language Arts and Literature for 17 years. My students are 8th graders at Highland Middle School in Libertyville, Illinois. This year, I have about 80 students in total and each LA/Lit class period is 80 minutes long. Which novels are your students reading this year? We started the year with a study of S.E. Hinton's The Outsiders. It's timeless. My students love the dialogue, the characters, and the realism of the characters' problems. Then we studied Elie Wiesel's Night. It is a challenging work to examine at any age, and it links to the students' study of World War II in Social Studies. We are ending the year with Harper Lee's To Kill a Mockingbird. We pair this novel with the movie 12 Angry Men. It is always a classroom favorite. For their independent reading, my students have been excited about John Green's The Fault in Our Stars and R.J. Palacio's Wonder. How often do your students have the opportunity to Skype with authors? Do you arrange these visits or are they arranged by someone else at your school? For the last few years, we have had about two Skype visits per year. A committee of LA/Lit teachers research potential authors and their books with our Learning Center Director. The Learning Center Director then arranges the visits for the school. Unfortunately, coordinating and planning Skype visits can be difficult. Even within a single grade, we have several classrooms of students. If the visits are school-wide (6th through 8th grade), the schedule becomes even trickier. Our goal is to plan the visits so all of our students have an opportunity to participate. How does your classroom prepare for a Skype author visit? The students do a lot of work beforehand. To start, we announce the author, and I encourage my students to read their work. If the author wants to focus on a single book, then the kids focus on that book too. Otherwise, they choose different books by the author so that the class is prepared to ask questions across the author's work. Just before the visit, each student submits questions that they would like to ask. The class compiles and refines the questions, grouping similar ones and rephrasing them, if needed. Finally, each student is assigned two questions from the list. This gives each student individual time with the author. It also ensures that our questions are not redundant and cover a wide range of topics. Are there topics you'd love to hear authors discuss with your students? Failure is a big one. Middle schoolers appreciate honesty and realism. They like to hear stories about persistence and struggle and how it is part of the path to success. I love when authors listen to my students' questions and then offer answers with a real backstory. This lets the students connect with writers as people. And now the sentence that started my brain wheels spinning... From a teacher's point of view, how does the experience of a Skype visit compare to an in-person author visit? I think it is a completely different experience. In many ways, Skype is more intimate than an in-person author visit. Instead of an assembly setting, Skype visits feel face-to-face. Kids view authors as rock stars. A Skype visit often allows the kids to see inside an author's home or office. Sometimes, the questions get more personal because Skype shows authors in the environment where they write. For example, one author held her laptop camera up to her office window. My students were able to see the view that she sees as she works. Another author walked the camera to her closet and showed my class her stack of rejected manuscripts and past drafts. The papers formed an impressive pile. My kids were amazed and the image stuck with them--rejection is an important part of success. I love that listening to an author's personal stories turns my students into different readers. If you could give one piece of advice to authors about Skyping with your students, what would it be? Achieve the gray. Middle schoolers love to hear about the area between black and white. They engage with topics that bother them. In a Skype visit, talking with an author feels one-on-one to my students. Allow the kids to be open and keep a balance between what the author wants to talk about and what the kids want to know. Be prepared. The class may take the conversation in a different direction than the author is planning. I'm reading Far From the Tree by Andrew Solomon. The book explores case studies of families and shows how hard it is to be a parent. 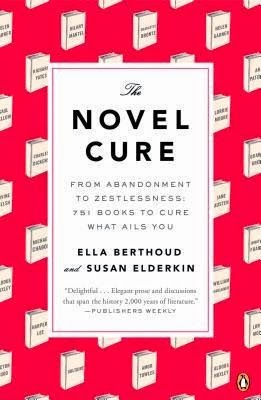 I'm also reading The Novel Cure by Ella Berthoud and Susan Elderkin. Every summer, I read all of the Rebecca Caudill and Abraham Lincoln nominees so I can recommend books to my students for independent reading. That's quite an impressive To Be Read Pile, Mrs. Dirst! Writers, Teachers, and Librarians -- Any insight you'd like to add to the conversation? and give a shout out to the incredible students, teachers, and staff at HMS. I LOVE THIS!!! I would have been beyond excited to hear directly from my favorite authors as a kid. I have my first Skype visit coming up in a couple of weeks, and this post is a godsend! Thank you for the teacher's perspective as well as the students' point of view. I love the idea of being able to visit with readers on the other side of the country face-to-face! 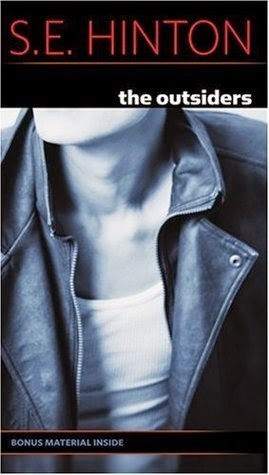 I also studied The Outsiders in 8th grade. I already loved the book, but that was some of my first insight into how characters are developed and how powerful good writing can be. Thanks for this excellent interview! Good luck with your first Skype visit, Louise! I'm sure the kids will love talking to you.